The deal is reportedly worth $330 million over 13 years, which would make it the most expensive player contract in American sports history. Superstar outfielder Bryce Harper has made his choice — and it's the Phillies. NBC Sports Philadelphia reports that the former longtime Washington National is switching to the inter-division rival, Phillies. Details of the deal are not yet known, but several Major League Baseball national reporters have tweeted that the deal is worth $330 million over 13 years. That price tag would make it the most expensive player contract in history. Harper was the biggest catch of the baseball offseason. He spent the last few months trying to secure a mega-contract worth in excess of $300 million. He played for the Nationals his entire career, after being drafted first overall in 2010 as a five-tool prodigy. The Nationals gave up on re-signing Harper in recent months, and the move to Philadelphia would reshape the power structure in the National League East. In recent years, the Nationals had won four of the last seven NL East division championships. Harper Mania had enveloped Philadelphia's rabid sports fans in recent weeks. He joins a Phillies team expected to be much improved this upcoming season. The All-Star slugger, who's been named everything from the National League's Most Valuable Player to the NL Rookie of the Year to the Silver Slugger, has a career .279 batting average with 184 home runs, with a .388 on-base percentage. Phillies principal owner John Middleton had made it clear that the team was willing to pay what was needed to land Harper or the other big fish of baseball's free agency, Manny Machado. Machado signed earlier in February with the San Diego Padres. His contract is reportedly $300 million over 10 years. 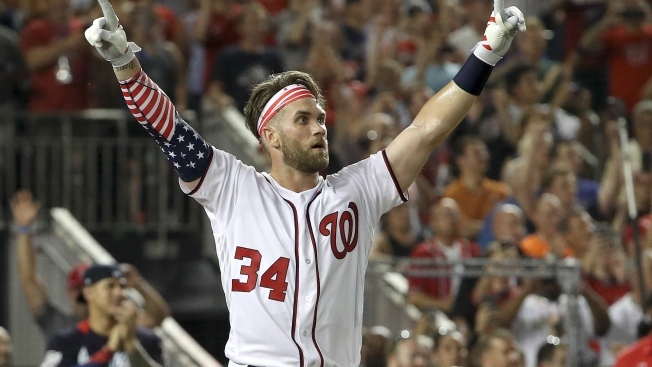 Harper's reported contract is $5 million richer than Yankees slugger Giancarlo Stanton's $325 million contract that he signed three years ago with the Miami Marlins. Harper's is the largest of three mega-deals signed this offseason. The Colorado Rockies re-signed their star third basemen Nolan Arenado to a $260 million deal.